My house smells wonderful right now. I'm making baked chicken breasts that have been marinating in Italian dressing. In a bit, I'm going to toss some shredded mozzarella on them for the last few minutes before eating. I have rice to go along with and am steaming some broccoli. It will make a lot so I have meals for the next few days. This, as we know, is important to someone who is pinching pennies. Leftovers means less money spent on what could be less healthy food. I'm not sure if it was Jessie who asked or someone in my World of Warcraft guild. The subject of summer food came up and I mentioned I was going to make "cottage fries". They didn't know what those were. I have to admit that I didn't know what they were either until I was watching a cooking show eons ago. We always called them "fried potatoes" when I was growing up. You take your potatoes, peel them and slice them. They shouldn't be paper thin. I'm told a mandolin gives you precisely cut slices every time. I think that kind of takes the romance out of slicing potatoes. I do have a super sharp Cutco paring knife I use. If I could afford to get another, I would. I love it and it cuts everything quickly. I am very good about not cutting myself while doing this. I don't remember the last time I added a chink of Deb to the meal. Once the potatoes are sliced, they go into a frying pan. I used to add about 4 teaspoons of butter, cut into slices and dropped around the layers. Now, I put a tablespoon of olive oil in the pan, heat it on medium, and add the potatoes. I also add garlic salt and one teaspoon of butter. I like the flavor that mixture gives. These were yukon gold potatoes which have a delightful flavor on their own. Now, you have your potatoes in the hot oil. Here's where it really becomes personal choice. I don't saute them, i.e. keep them moving. I let them sort of sit there because I like about half of them to become really crisp and browned. So, I watch and stir about every 5-7 minutes, letting some just sit and brown on the bottom of the pan. I do this for roughly 30 minutes. You can eat cottage fries as they are, as an accompaniment to steak or hamburger. That's how they were served when I was young. My dad, who spent some time as a short-order cook, knew just how to make some of them crispy and the others cooked through but not soggy. I like to use the cottage fries as a part of a meal. While they are cooking, I slice smoked sausage into 1/2 inch slices. 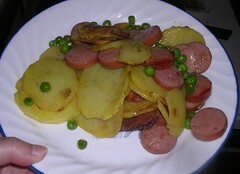 After 30 minutes, I add the sliced sausage and frozen peas to the potatoes. I put a lid on the pan and cook the whole thing for another 15 minutes, turning the heat down to low. I like the look of the dish but I am all about color, whether it's the wall in my house, the flowers in my Hawaiian shirts or the food on my plate. You can see the browned potato slices here. 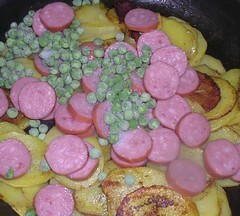 After 15 minutes, the meal is warmed through, the potatoes are soft and the peas are cooked. I usually take the lid off the dish and let accumulated water steam off. This crisps up the potatoes nicely. This made enough for me to eat hearty and have a container full for a lunch this coming week. I like to think these kinds of meals are the ones you remember the most, the simple repast, served with a mug of tea and a cat who seems to think what you're eating is something she wants. Plus, it just looks good on a plate. It was me - and like I said on flickr you had me until the peas - blech! I made my famous roast beast tonight and the place smells delightful and my tummy is full.